The frequency of your newsletter mail-outs will depend on your subscribers' preferences, your goals for your newsletter, and your available time. Here's how to decide how many mail-outs is just right. When you delve into email based marketing, at some point, you're going to wonder how often you should send out your newsletter. The long answer to that question is, it depends on your audience. Different newsletter audiences will be happy with different levels of newsletter frequency. The short answer is somewhere between once a month and once a week should work, but start with once a month. The frequency and timing of your mailings is something you can experiment with. Unfortunately, I can't give you a magic answer. Cookie cutter advice like, send out one newsletter per week on Tuesday morning at 7:00am Eastern Central Time just doesn't work because business goals, available time, and the expectations of subscribers will vary from one company to the next. You simply need to experiment a bit and watch your statistics to see how readers respond. Do you make more sales when you send out your newsletter on a weekday or a weekend? What time seems to be best? Do a lot of people unsubscribe if you send out your newsletter more frequently? Do fewer people open your newsletter if you send it out less often? You'll be able to see all of those statistics when you use a newsletter service, and if you watch them over time and experiment, you can develop a feel for the best frequency and timing for your subscribers. Here's why I'd suggest doing your email based marketing at least once a month, but no more than once a week. 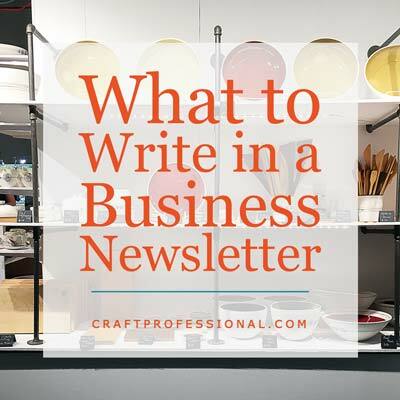 It's important to keep your newsletter subscribers engaged and ensure they remember you. If you wait more than a month between newsletter mailings, they may forget who you are and why they signed up for your newsletter in the first place. That's when you get a lot of people unsubscribing, or worse, marking your emails as spam because they may forget they chose to sign up for your newsletter. Have you ever unsubscribed from a newsletter you liked simply because they were sending too many emails? I certainly have. There are a couple of stores I like that were sending me emails every single day. I shop there, and I like to know about sales and special coupon codes, but I also find myself annoyed dealing with their emails every day. I unsubscribed even though I know it means I'll miss out on some good deals. Receiving too many emails is the biggest complaint people have about newsletter subscriptions. What happens when you start sending too many emails? People stop opening your emails, unsubscribe, and even mark them as spam. While some newsletter audiences may tolerate more frequent mail-outs, the data I've seen (see the link above) indicates that sending once per week is a safe level. I'd suggest you start your email based marketing with once a month mail-outs. Initially, launching a newsletter my feel a bit daunting. You may struggle to find good content to share. Once a month is a good starting point. It's not a huge amount of work to write 12 emails per year, but it's enough to keep your subscribers engaged. 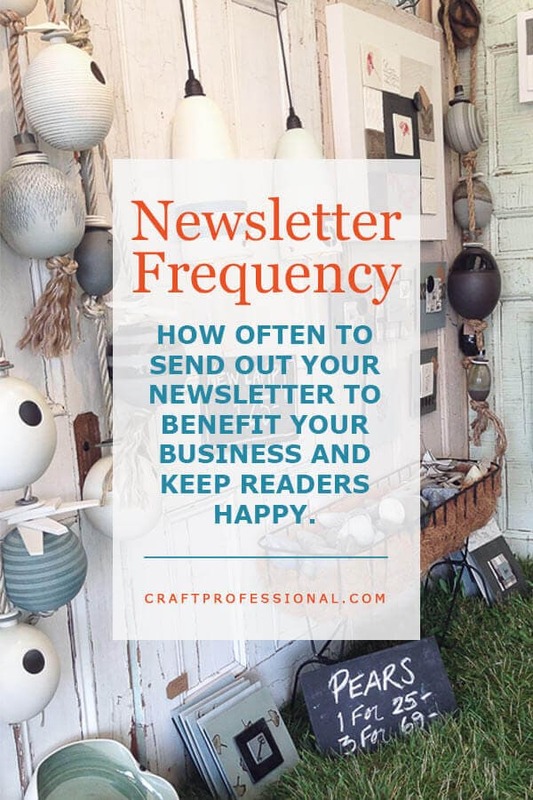 Once you get your newsletter established and it feels more routine to you, if you'd like to mail out a newsletter once per week or every other week, you can increase the frequency. This is the strategy I took with my own newsletter. I wrote once per month for several years, and it worked out well. However, I've recently committed to writing more new articles than I have in the past, and I found my once a month newsletters were getting way too long, so I switched sending them once per week. I let my readers know about the change and the reason for it, and I watched all of my statistics to make sure readers were happy with the change. 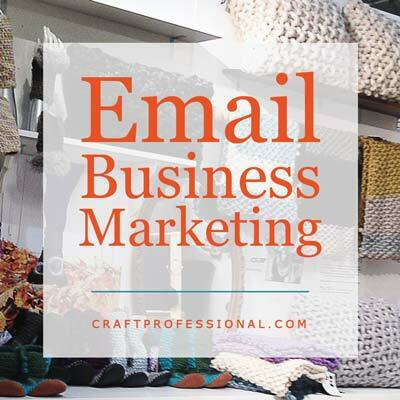 There might be times when you do your email based marketing more or less frequently. That's fine occasionally. 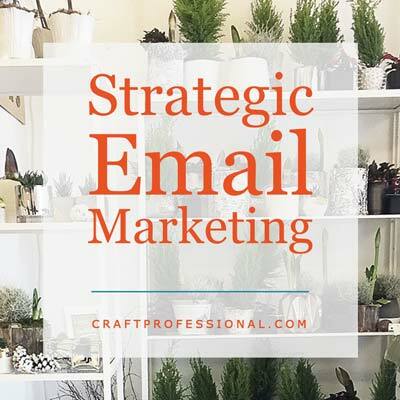 If you're having a big sale or unveiling a new special product and you want to send a few extra emails, it's fine to occasionally send emails more often than once a week. Be aware that you might get a few more unsubscribes than usual that week. However, if it boosts your sales or helps with the successful launch of your new product, it's worth the tradeoff. 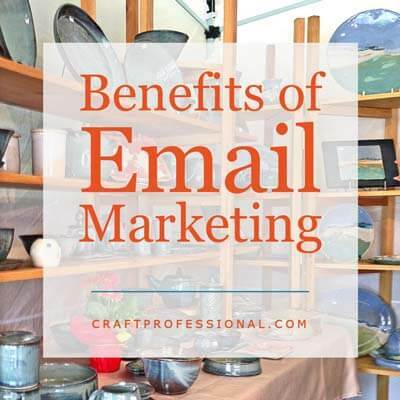 There's always a balance to be found between sending more emails (which boosts sales) and fewer emails (which keeps unsubscribe rates lower). 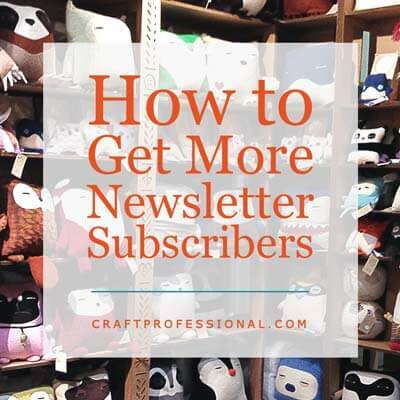 Sometimes you need to experiment a bit, watch your numbers, and look for that sweet spot where your newsletter is giving both your business, and your subscribers the most benefit. You might find times when you get busy and neglect to send out an email. Don't sweat it. If you miss a month, just get back at it as soon as you can. Your newsletter subscribers will forgive you. I once went an entire year without sending out a newsletter. It's embarrassing to admit, and when I look back at my old newsletter statistics, I feel disappointed in myself. My youngest son was a baby, and I was sleep deprived and deep in some other priorities. Without really intending to, I just let my email based marketing go. After a while, it fed on itself and it was hard to get started again. I resumed my newsletter after a year, and everything was absolutely fine. I did have a high unsubscribe rate for that first mailing (about 4 times my usual unsubscribe rate), but that was completely expected. After that first email, my newsletters just continued as usual. I definitely don't recommend going a year without sending a newsletter. However, what you can take away from this story is you shouldn't let a missed month or two of sending a newsletter stop you from getting right back at it. Do your absolute best to stick to a minimum once a month schedule, but if life gets in the way, just pick it back up as soon as you can. If you can get ahead by a couple of newsletters, you won't risk losing momentum when things get busy. This advice, I know, is easier said than done. I'd like to get ahead myself, but as I'm writing this sentence, I am woefully behind on my newsletter for the coming week, and I think I have a late night in my near future. 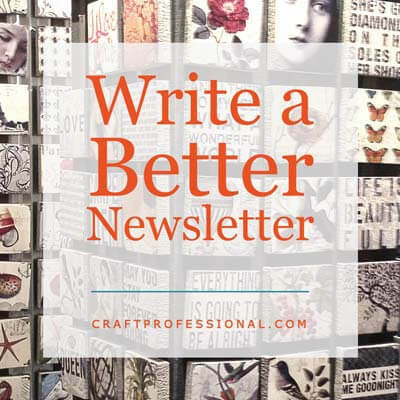 If you have quieter times in your business (January through March is quieter for some craft professionals) working on writing a couple of extra newsletters will help get you through busier seasons. Once you have a good sized following, you can find out what frequency your audience prefers. You could send them a survey and ask them directly what they prefer. Survey Monkey is a good option, and it's free for basic surveys. Alternatively, you could experiment with different frequencies and watch your open rate (what percentage of people open your emails), your unsubscribe rate (how many people unsubscribe every time you send an email) and your sales immediately following emails. Don't get too bothered by statistics, though. If the idea of tracking all of those numbers is completely overwhelming, don't let it stop you from sending out newsletters. Just use your best judgment based on what you already know about your customers. 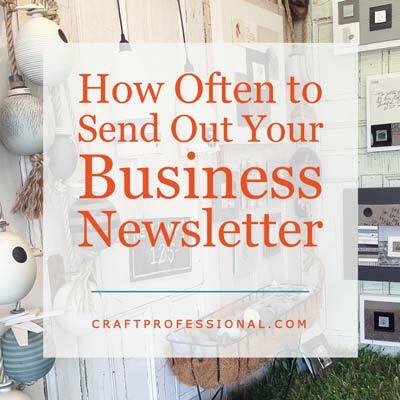 Once sending out newsletters feels routine to you, you might feel more excited to see what your numbers are saying. There's no need to get immediately mired in stats if that's not your thing. It's wise to send your newsletter on the same day and same time. That way, people who look forward to hearing from you will know when to expect your newsletter. Sending your newsletters out on a specific day and time can also help keep you on track because you'll have a deadline to finish your next newsletter. I know, when my newsletter is due to go out the next day, and I haven't written it, I need to carve out some time and get it done. I've made a commitment to my subscribers to send a newsletter on a specific day, and I know some really look forward to it. Without a set schedule, I would easily skip newsletters. Currently, I send out my newsletters every Monday at 7:00am, and I move that to Tuesday whenever Monday is a holiday in the U.S. or Canada so the newsletter doesn't get lost amid people's holiday fun. If I had more subscribers from other countries, I'd factor in their holiday schedules as well. I've experimented with different days and times, but none seem to make a big difference in my open rates. However, that's how my subscribers respond. Your subscribers will have their own unique characteristics, and, as a group, they may prefer receiving your email at a different day or time. 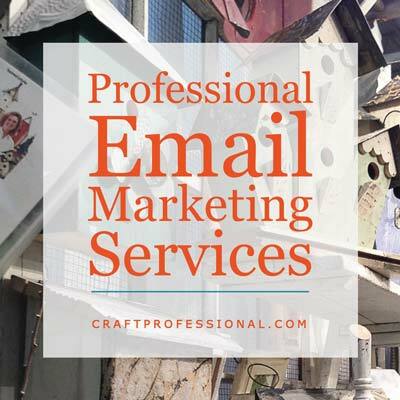 Simply choose a day and time to send your newsletter that makes sense for you, and once you have several subscribers, you can experiment with it to see if sending your email on a different day or time affects your open rates. You know how often you're going to send out a newsletter, but before you write a single newsletter, you need to have the right tools. 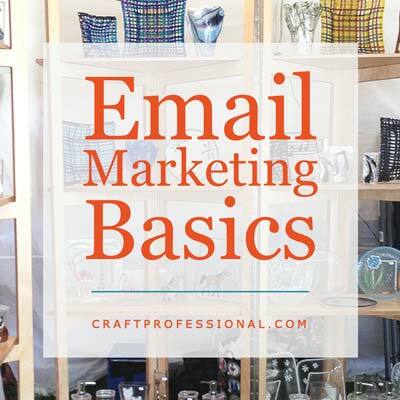 Here are several resources you can use to send out your newsletter.